The Civil War began in Charleston when rebels fired upon Fort Sumter to preserve slavery. This past week Charleston has made better history by demonstrating a Christian forgiveness between blacks and whites that is nationally unprecedented. The killing of a single black man in Ferguson and the arrest and subsequent death of Freddie Gray, a black 25-year-old in Baltimore led to riots, arson and looting. But the murder of 9 African-Americans in a church Bible study by Dylann Roof, a white supremacist whose goal was to start a “race war” – had a totally different outcome. Thousands of blacks and whites came to the streets around Emmanuel A.M.E. Church, one of the oldest black churches in America where the Charleston 9 were killed. Night after night the racially mixed crowd joined in mourning together – expressing contrition, holding hands and singing Christian hymns. Nadine Collier, whose mother was murdered, told Roof: “I will never be able to hold her again. But I forgive you and have mercy on your soul.” Compassion and forgiveness dominated the statements of all relatives. However, Roof listened impassively, staring ahead. The nation has witnessed a series of white-black confrontations over the past year that have sparked racial tensions. One was in North Charleston, only a few miles away from “Mother Emmanuel Church,” as it is affectionately known. A white police officer stopped a car for a minor traffic infraction, prompting the black driver to run from the car. The policeman shot him in the back. Fortunately, the incident was captured on video, showing the cop putting handcuffs on his victim, rather than doing anything to help him recover. That incident inspired S.C. State Senator Clementa Pickney to introduce and push for a law that mandated police officers to carry videocams to record every arrest. 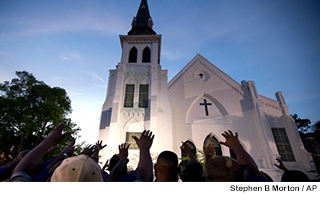 The law was passed and signed one week before the Charleston 9 event. One of the victims was Clementa Pickney, who was also pastor of Mother Emmanuel, and led the Bible study. On Monday S.C. Gov. Nikki Haley called for the Confederate flag to be removed from the grounds of the State Capitol. That inspired Alabama Gov. Robert Bentley to order the immediate removal of a Confederate flag from Capitol grounds. Two workers quickly and quietly removed it Wednesday. It will not be so easy in South Carolina, where two-thirds of the Legislature must vote to banish it. Similarly, Wal-Mart announced Monday that it would remove any merchandise featuring the Confederate flag from its website and stores. Sears, Kmart and Internet giants eBay and Amazon quickly followed suit. A flag manufacturer announced it would halt its production. Tuesday night the board of the Citadel – the South Carolina military college whose cadets were among the first to fire on Union troops in the Civil War – voted to remove the flag from the school’s Summerall Chapel. All of this was sparked by the mourning of black and white South Carolinians.